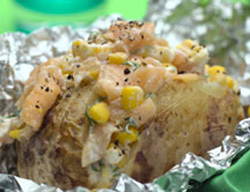 Bake the potatoes in the microwave for approximately 10-15 minutes or until cooked. In a bowl, combine the salmon, sweetcorn, crème fraîche, dill, lemon juice, Worcestershire Sauce and seasoning. Cut the cooked potatoes open and place the salmon mixture into the potatoes. Serve straight away, garnishing with dill. Cook’s Tip: to crisp the skin of the potatoes, place the potatoes under the grill for a few minutes before adding the filling.